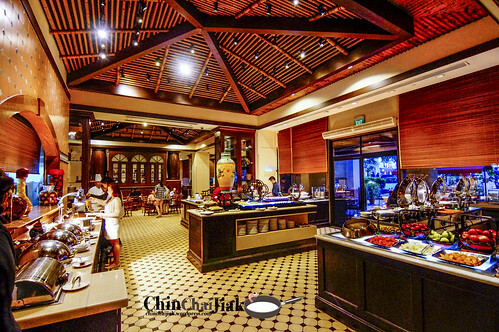 Ellenborough Market Cafe, has always been very well known for their International Buffet and famous for their selection of Peranakan food. Thank you Diane from Swissotel for the invitation to the launch of this Seafood Buffet Extravaganza. This buffet is available till 26th July and only for dinner. 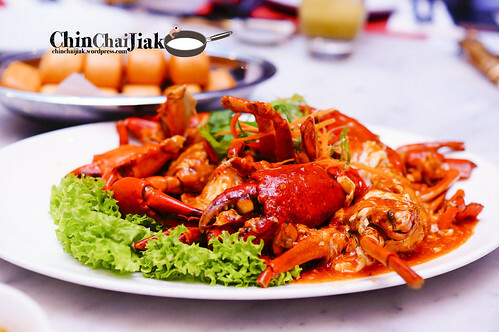 This $68++ seafood buffet comes with a good selection of seafood like Chilli Crab, Black Pepper Slipper Lobster, Black Bean Slipper Lobster, Salt Baked Crab, Black Pepper Crab, White Pepper Crab, Scallop Fried Noodle, Crab Meat Fried Rice, Salmon Sashimi and Big Prawn Noodle. Note what what’s indicated here may not be available all at once. 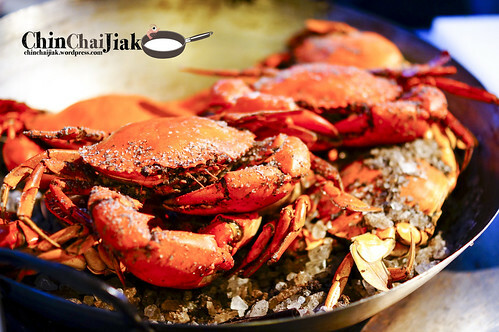 For instance, the black pepper crab and black bean slipper lobsters are available as alternate menus. For this session, a few of their signatures are plated separately so some of my photo’s plating is not what you will see during the buffet. This is my favourite of the day. 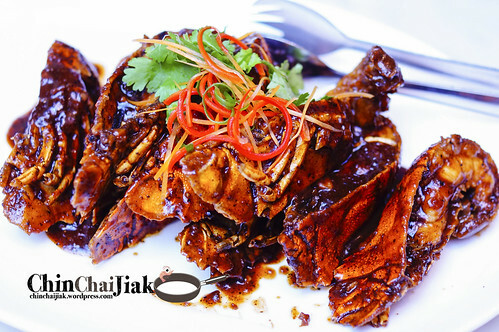 The texture of the meat taste very fresh, succulent and the sauce is very much to my liking – rich, flavorsome, with just the right spiciness and a hint of sweetness. Most importantly, it’s relatively easier to eat comparing to their cousin prawn and cousin crab, and it’s free-flow. For someone who like Tomato Sauce, I thought the sweetness is ok but some at the table feedbacked that the chilli sauce is a little too sweet. The size of the crab, both served and at their buffet counter are quite well-sized. The crab meat is pretty sweet and overall a decent dish. I have mixed feelings about the dish. On one hand, the originally succulent meat became a little dry due to the baking but on the other hand, it’s packed with the fragrance of spices upon taking a bite. I think this is something of acquired taste but personally I prefer something crabs that are juicier. I wasn’t expecting a lot of a seemingly local dish from an international buffet but the soup managed to convince me to go for a second bowl. There’s no mantis prawn in the noodle as it’s only used in cooking of the broth. 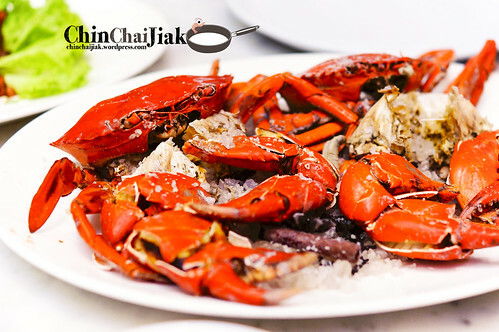 The soup is rich in flavour, seafood sweet and is pretty good for a buffet standard. 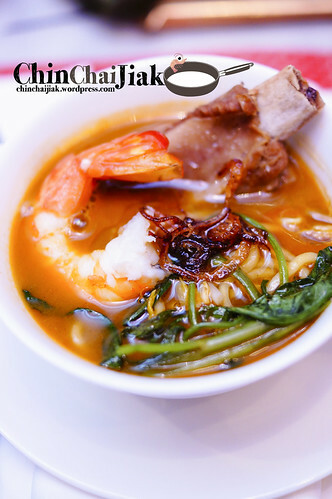 However, I’m not sure if people will be too excited over prawn noodle at an international buffet though. 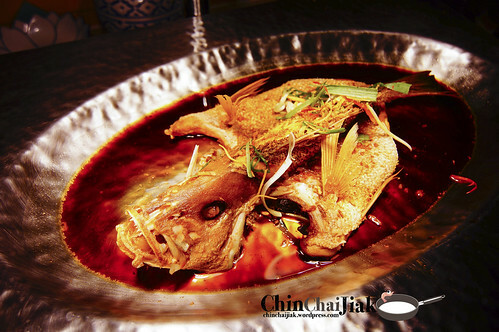 If you fancy those Hong Kong Style steam grouper served at a wedding banquet, this is what to be expected from this grouper. 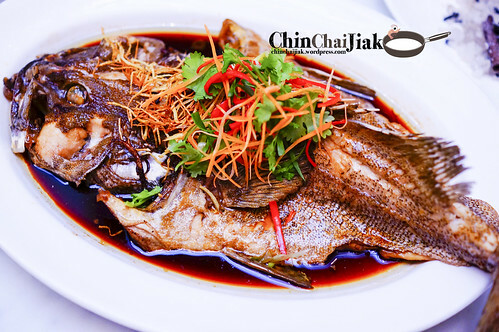 The tender steamed fish is fresh and soft and love the sauce that comes with it. A good choice to balance off the strong flavoured chilli crab and pepper slipper lobster. 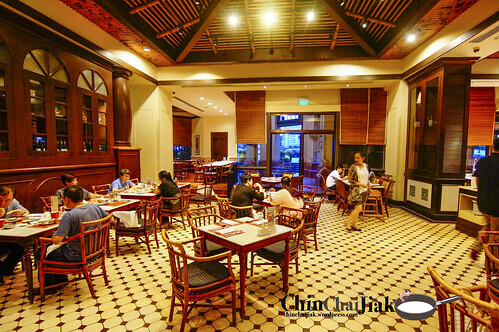 On my visit, Ellenborough also offers staple food like Crabmeat Fried Rice, Scallop Fried Noodle and Seafood Bee Hoon. 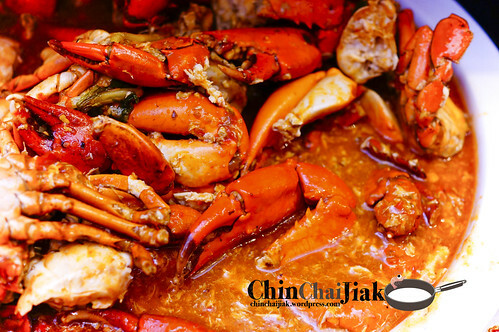 For finger food, there are Fried Crab Claw, Prawn Kueh Pie Tee and Grilled Otah. Then there’s the usual cold selections with the must-have Salmon Sashimi, Chilled Baby Lobster, Snow Crab, Flower Crab and Scallop on Shell. 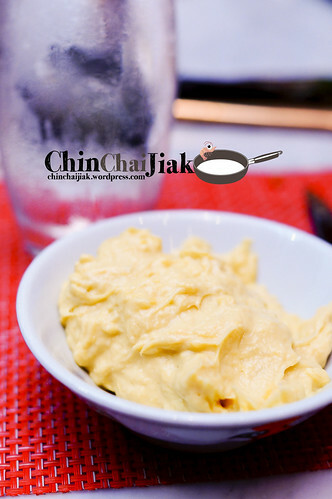 They also offer a spread of cakes, pastries and nonya dessert like Cheng Teng, Burbur Cha Cha and Tao Suan. And of course, a meal at Ellenborough is not complete until you have a bowl of their infamous Durian Pengat. 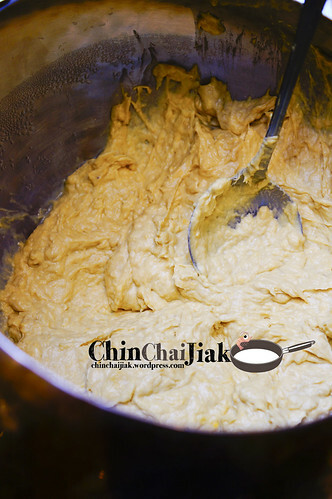 This signature dessert of theirs has always been my all-time favourite and is always available during lunch and dinner. Price wise, it will be more worth it if you visit in fours as there’s a 3-for-1 credit card promo going on, which adds up to about $60 nett per head. I think the pricing is quite reasonable, especially when some people of us can fork out $50 for a lobster roll. Although Ellenbourough does not have the widest selection for buffet comparing to some buffet lines nowadays, i thought the spread is pretty sumptuous, with the focus on the more expensive seafood for this seafood Extravaganza. Taste wise, Ellenborough has been very consistence in delivering food quality of a certain standard and keeping their customers satisfied. If there is one thing to improve, it’s probably their dessert selections. 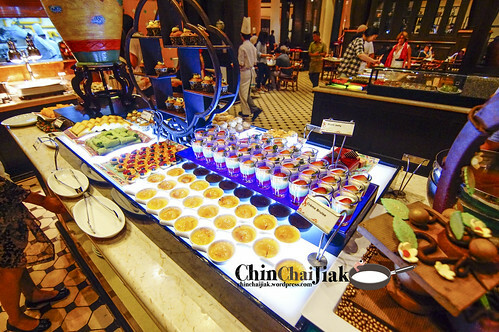 The classic Peranakan Kueh selection is awesome however i personally feel that they may want to instill some fresh and interesting dessert ideas that may attract the younger crowd. On a side note, i really think the lighting of the restaurant is not very photo friendly. It’s not easy trying to take a decent shot of their food, especially at the buffet line area where it’s all harsh yellowish light that made the food photo not as exciting, which to a certain degree, impacting the influence on the social media platform. This entry was posted in Uncategorized and tagged Black Pepper Slipper Lobster, Chilli Crab, Clarke Quay, Durian Pengat, Ellenborough Market Cafe, International Buffet, Mantis Prawn Noodle, Merchant Court, Peranakan Buffet, salmon sashimi, Salt Baked Crab, Seafood Buffet, Steam Grouper, Swissotel Merchant Corut. Bookmark the permalink.